FAYETTEVILLE, Ark. – The economic impact of the University of Arkansas on state and local economies has grown from $725 million in 2009 to $1.2 billion in 2014, a 66 percent increase, Chancellor G. David Gearhart announced during a news conference Feb. 10. That figure comes from a report prepared by researchers in the Center for Business and Economic Research at the Sam M. Walton College of Business. The center previously prepared an economic impact report for the university in 2009. The center’s researchers again found that the university has both short-range and long-range effects on state and local economies by developing human capital, fostering a knowledge economy and providing a sustainable economic base for growth in Northwest Arkansas and the state as a whole. During 2014, spending by students contributed $307.4 million to the economy in Northwest Arkansas, and spending by campus visitors added another $35.8 million. The student spending was determined through a survey of a representative sample of the student body – 2,600 of the 26,200 enrolled in the fall. While student spending is allocated to a variety of categories, the largest monthly expenses of students were rent, restaurants and bars, and motor vehicle-related purchases. The study found that, in terms of human capital, there are more than 68,622 University of Arkansas alumni living in Arkansas, up from 60,000 alumni living in the state in 2009. They represent every county in the state and account for 2 percent of the state’s population. Together, Arkansas alumni are contributing $54.9 million in sales and use taxes to state and county governments and an additional $114.8 million in state income taxes. The researchers calculated that university alumni living in the state earn $2.3 billion in wages each year, significantly contributing as workers, business leaders and consumers in their local economies. In the Northwest Arkansas region, the university’s economic impact is estimated at $932.3 million in 2014. This economic impact includes $907.2 million in recurring annual economic impact and $25 million in one-time construction impacts. The annual business operations of the university contribute $522.2 million to the Northwest Arkansas economy, while student spending contributes $307.4 million. Visitors to Razorback athletic events, the U of A admissions office and students contributed $35.8 million in spending in 2014 and the economic impact generated by university-affiliated volunteers is $3.8 million. The operations of tenants in the Arkansas Research and Technology Park add nearly $38 million to the regional economy. In terms of sustainable economic growth, the study finds that the university, one of the largest employers in Northwest Arkansas in 2014, had a total payroll of $317.9 million. The report was first commissioned in 2009 by Chancellor Gearhart, and then again in 2014. The center researchers spent four months (September 2014 to January 2015) preparing the report. Deck joined the Center for Business and Economic Research in 2001, and has managed 99 economic studies for clients that include various counties and municipalities across Arkansas, Arvest Bank Group, Chesapeake Energy, the Jones Center for Families, the Arkansas Economic Development Commission, and Bikes Blues and BBQ. 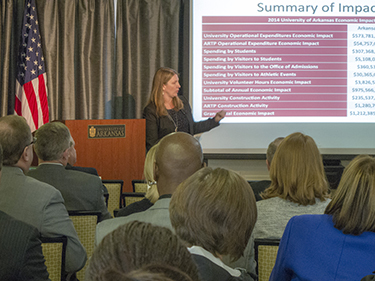 The full report is available online economicimpact.uark.edu.